Wesleys Cafe is Baildon’s community cafe, where a warm welcome awaits you. Did you know that Wesleys Café is now open for drinks and light refreshments every weekday afternoon until at least 3:00pm (longer on some days). Meet your friends in the afternoons at Wesleys? Drop in for a drink when you’ve been out for a walk? Arrange a group activity such as meeting friends to play a table game or do some crafts? Bring your toddlers to play in the crèche area? Read a book in our café area or link up to our internet provision. Everyone is welcome to come into the warmth and friendliness of Wesley’s Cafe. Just drop in any weekday afternoon. Always available are Taylor’s Fair Trade coffee and tea, light refreshments and a range of Fair Trade foods. Freshly cooked lunches are also available from Monday to Friday. Wesleys Cafe took on its current form in 1995 with the aims of providing an outreach to the local community, a service to the Church family and opportunities for voluntary service. The hope is that any profits generated will be used for mission to the local community. 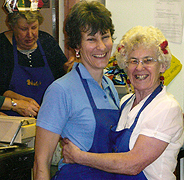 Wesleys Cafe employs two cooks, Mary and Lynne, job-sharing, but their work would be impossible without the help of about 75 cheerful volunteers, most of whom give up 2 hours of their time once a week, once a fortnight or once a month. Their duties involve taking orders or preparing salads and sandwiches and serving drinks and snacks. There is a tremendous feeling of fellowship in our kitchen: ‘the Fellowship of the Kitchen Sink’. New volunteers are always welcome, no experience is necessary – just a smile and a willingness to ‘muck in’. If you love being with other people and would like to serve your community please consider joining the happiest workforce in the district. In addition to its regular service, the cafe is willing to cater for baptism meals, funeral teas and for special occasions. For the Church family, we cater for special occasions such as Easter breakfast, Anniversary and Harvest teas, Christmas lunches. Come on your own or in a group we will always try to make you feel welcome. To find out more, please contact the Cafe on 07407 607081. Wesleys is open Monday to Friday from 10:00am to 3:30pm. We serve hot lunches from 11:45am to 1:45pm. We are open on Saturday from 10:00am – 12:00pm for coffee and snacks. Hot drinks, snacks and freshly baked cakes available each day. Coffee is available on Sunday after morning Worship.